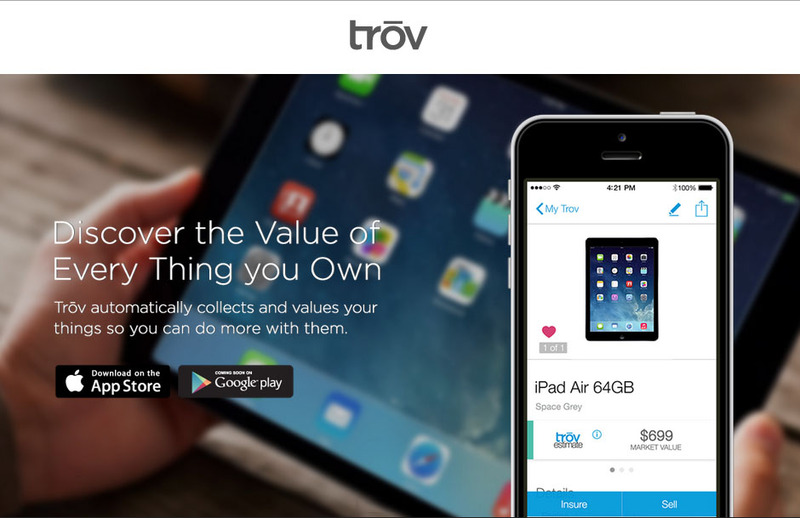 Trōv Will Track Your Stuffs so You Can Sell Them Later! We own a lot of stuffs. Some we need, some we don’t but most we should recycle. Or sell. But the thing with selling second-hand stuff is that its hard to get a good deal. Trōv remedies this by making it ridiculously easy for people to collect the information about their belongings, track their current market value and a lot more. The company’s leadership includes CEO and founder Scott Walchek, co-founder and VP of Business Development Mark Dowds, CTO Jim Gemmell, VP of Marketing Jeff Berezny and Director of Product Carlos Jimenez. They are headquartered in the San Francisco Bay Area and have a dispersed team of engineers around the globe. In 2012, Scott realized that there is a huge amount of untapped potential in the stuffs people own. According to a study by Credit Suisse, over 50% of the world’s wealth is made up of tangible assets, yet there is no easy way to manage this wealth. Furthermore, most people have tons of stuff, but it is not in any way digitized, making it extremely difficult to take action with, for example, organizing important documents like receipts, understanding the current financial value, selling them and insuring or filing a claim. Trōv is reinventing the way people manage their belongings by equipping them with a smart and secure inventory or their “Trōv”, which is updated automatically after purchase, complete with photos, details and related documents. This is done by linking email receipts, snapping a photo of paper receipts, scanning barcodes or searching our product database. Not only that, Trōv will track the market value over time and notify when there is a significant change. Initially Trōv was targeting ultra high-net-worth individuals as there was a perceived bigger opportunity amongst individuals who had a larger amount of wealth. The intent was always to progress towards the masses, but to start with the ultra wealthy. After a year of selling a relatively heavy subscription model, that included on site appraisals and individualized service, they realized that it wouldn’t be scalable and that there was actually a bigger opportunity with a mass market approach. “This was a great learning experience, but also a hurdle as it took significant time and resource to overcome”, says Jeff. Trōv managed to re-invent itself just in time for it to still have a head-start in the market. The app is currently available in the United States and Australia only on iOS. It will be releasing on Android in those two markets and then gradual international releases in the UK, Canada and other European countries in the next 18 months. Trōv is free, but if a user opts-in, there are opportunities for monetization through sales commission and insurance referrals. Head over to their website for more details and app downloads. Play at SportsTradex to Win Everyday !! Previous articleGet Leads Sent To Your Inbox With LeadFuze!